I have two great loves: nature and words. My pursuit of these passions has led me down two intertwining paths to become a scientist and a writer. While studying biology and English as an undergraduate at UC Davis, I got my first taste of travel writing as a “correspondent” for the university while studying abroad in Scotland. After deciding to pursue my love of the ocean, I received my master’s degree in marine science at Moss Landing Marine Laboratories. I chose to study fish because I wanted to benefit both nature and people. Fish became that bridge. My research focused on California’s newly established network of marine protected areas, and how the food web (as revealed by what fish were eating) could be affected by these protections. My interest in storytelling then led me to the Science Communication program at UC Santa Cruz where I learned many tools for communication, and emerged still wanting to keep a hand in both science and writing. Fortunately, I have been able to merge both of these interests as the Communications Director and a Fisheries Biologist at the consulting company FISHBIO, where I have worked since 2012. In graduate school, I dreamed up a way to meld the professional with the personal: by studying fisheries in Southeast Asia. My personal interest is in Vietnam, where my mother’s family is from. 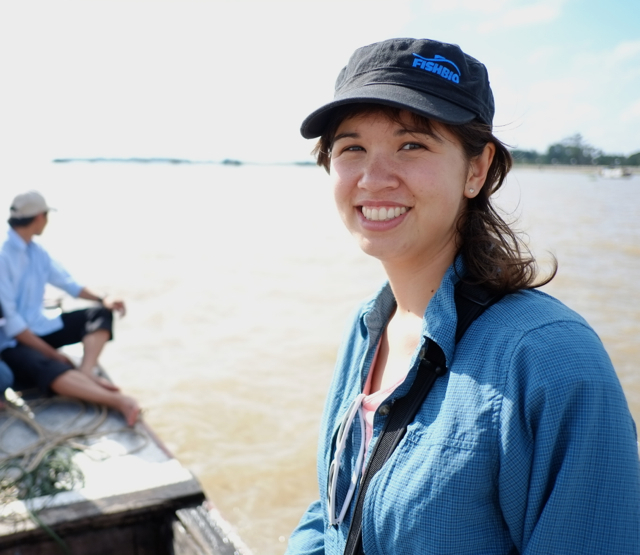 I was drawn to FISHBIO’s fish research and conservation program in Southeast Asia, and have since worked in Laos, Cambodia, and Myanmar. Through this work, I have made the bridge from the ocean to freshwater, especially in the Mekong, the Mother River. The common thread is still fish. And I still often work with protected areas, though now they are in rivers. Although my professional journey has brought me so close to my dream, my personal journey is the one leading me to Vietnam. I am currently working on a writing and research project that combines family, culture, and nature in an exploration of identity and place. The dragonfish is my talisman on this path – not a particular species but an idea, a blending of science and personal mythology. I’ll be updating this website to share where the project takes me – follow along to see where the journey leads!